Ric Payne's Blog » Are you doing all you can to help your clients prepare for retirement? Home > Uncategorized, Your Clients	> Are you doing all you can to help your clients prepare for retirement? In this note I want to address something I raised in an earlier blog post about an accountant’s responsibility for alerting clients about the need to take financial planning very seriously and to do so from a young age. My interest in this piqued after reading Tony Robbin’s recent book called Unshakeable: Your Guide to Financial Freedom. More about Tony’s book in a moment. First, I read a transcript of a conversation about financial retirement strategies from a Wharton Business School podcast that took place on April 4. Among other things the conversation turned to the financial un-preparedness of so many baby-boomers (1946-1964) for their retirement. It seems that in the US, and I suspect it’s more or less the same in other “western” countries, the median amount in retirement accounts for people close to retirement in the 65-66 age group is only $44,000 and even the 90th percentile amount is only $370,000 which is not much for an expected life span of around 85 years. These people are obviously relying heavily on social security to cover their post employment living expenses but there’s a good chance that’s not going to turn out well for them. In the US the word frequently used in the context of social security is “insolvency” and some people are suggesting that payment cuts in the order of 25-30% are not unlikely. The bottom line here is that people really do need to start planning for their future and they should start at a young age. And that brings me to Tony Robbins’ book AND most importantly, what role accountants could play in alerting their clients to the importance of planning from an early age. My take on that is people who live in any western country are lucky, if they aren’t blessed with lucky genes their accountants are, and compounding is a matter of fact with the only conditions being a decision to start somewhere and having patience. On pages 22-23 Robbins presents an example to illustrate the power of compounding and apart from the fact that I believe his calculations are wrong he makes a great point and that is: if you start saving when you are young and even if you stop some way down the track you’ll still be better off than someone who starts later. He references two friends Joe and Bob. Joe puts away $300 per month starting at age 19 and stops at 27. Bob on the other hand doesn’t start until he’s 27 and then he saves $300 a month until he’s 65. Tony assumes a 10% per year tax free yield which he says is the average of the US stock market over the last century so let’s go with that. He then points out that by the time he’s 27 Joe has put aside $28,800 but if it’s been growing at 10% it would then amount to $43,854 which is Tony’s first calculation error but that’s no big deal. Now let’s move to the time Joe and Bob are 65. Remember at 27 Joe had a pot of $43,854 (of which $28,800 was his contribution out of his income) and he added nothing to it after that. Assuming 10% yield that would have grown to $1,640,342 by age 65. Bob, on the other hand starting at age 27, has diligently put away $300 per month but his fund at 65 has only grown to $1,548,102 despite having invested a total $136,800 during the 38 years. In other words Joe has parlayed $28,800 into $1,640,342 – I call this a yield leverage of 56.96 times what he put in. Whereas Bob has accumulated $1,548,102 having put aside 136,800 giving a yield leverage of only 11.32. Tony has completely different numbers to mine but the conclusion is exactly the same. Compounding is profoundly important and the sooner you start saving the better. 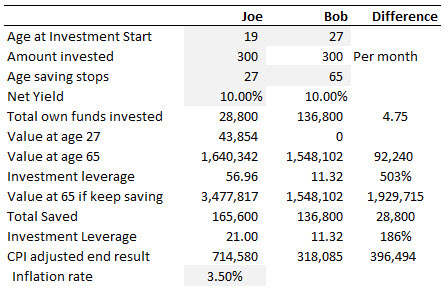 Not only that, If Joe had continued his saving plan after 27 he would have accumulated $3,477,817 by age 65 compared with Bob’s $1,548,102 – more than twice as much after putting away only $28,800 more than Bob. The end value of Joe and Bob’s respective pots is dependent on the assumed yield. For example given the initial assumptions a yield of 9.46% (only slightly lower than the 10%) would have resulted in both Joe and Bob having $1,327,297 at age 65. However, Joe would still have enjoyed a yield leverage index of 46.09 compared to Bob’s 9.70 and Joe could still have spent $300 per month on indulgences like vacations, cars, or sensible things like contributing to a house mortgage. You can download the spreadsheet I have used to do these calculations by clicking here. What’s this mean for a practicing accountant? The implication of this for a practicing accountant is to suggest that you start a conversation with your clients and in particular those with younger children about the importance of saving for their retirement which, I believe, is going to be more important in the future than it has ever been. I would go further and recommend that you even gift them a copy of Robbins’ book or a similar one but complement that with a conversation about the issues he raises. If you are involved with estate planning or distribution matters this would be a perfect time to talk about compounding. I know from personal experience very few people understand the power of compounding because humans, by nature, tend to be focused so squarely on the present. Another strategy would be to conduct seminars in your community to spread this knowledge and to contribute to increasing the level of financial literacy. This is something that not only builds your credibility as a financial expert it does so in a way that shows your serious concern for the welfare of the people in your community.